Vino!! That’s right we’re talking wine! It’s that time of year where the leaves start to fall, the sky begins to be painted with deep oranges and bright auburn colors and the temperature starts to cool down from a hot Carolina summer. That time of year when a glass of wine just seems like a perfect pairing to an array of fine cheeses as you sit around a fire and enjoy the new crisp, cool nights. A few years ago, most people would have never thought to sip a North Carolina wine while enjoying a starry night but instead a California, Washington or even French. But, that’s all changing with a new North Carolina vineyard. The ‘new kid on the vine” is Jones von Drehle Vineyards & Winery. A vineyard that was started out of a love and passion for the highest quality of wine. The vision and goal for JVD has been, from the start, to not cut corners and create the best glass of wine possible and with the help of well known and extremely respected winemaker, Dan Tallman, Jones Von Drehle has achieved that. 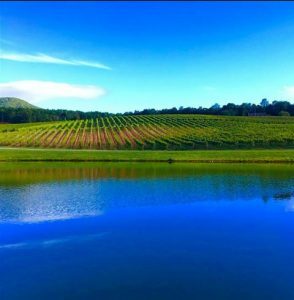 Nestled among mountain plains of the blue ridge JVD created breathe-taking views that complement their breath taking wines. Dan joined Jones Von Drehle just over 4 years ago after falling in love with the idea the Jones and Von Drehle families had for their future vineyard. With the help of his expertise, JVD has created a buzz in the wine industry here in the Old North State and a positive one at that. While winning countless awards nationwide and becoming one of the power house vineyards for wine in the south, JVD has stayed true to their original vision and one that I have extreme respect for. Yes, I might be a little in love with this winery, but when you’ve got quality like they do, well, I’d be crazy not to fall in love with them. So, instead of sitting at home this weekend, why don’t you travel on over to Thurmond, North Carolina and enjoy the calm gentle breeze of the blue ridge, relax with the rustling of grape leaves behind you and sip on one of North Carolina’s finest wines.